As refreshing as it feels to take a cool dip in the pool on a hot summer day, that cool dip isn’t going to feel quite as comfortable in, say, November. That’s why people around the world have added a solar pool heater system to their swimming pools, in order to enjoy warmer water temperatures throughout the year. Solar pool heaters are simple in theory—especially since most of the original pool equipment is relied upon to make the system work properly. When you have a swimming pool, you have a filter of some sort, as well as a pump to move the water from the pool, through the filter, and back again. There’s also the plumbing framework that travels from the pool, through the pump and the filter, and then back down to the pool once again. A solar pool heater simply adds an additional path for that framework to follow. Instead of looping right back to the pool after the filter, the water climbs up onto a nearby rooftop and travels through a twisty path through a solar collector array. As it moves through that array, heat collected from the sun warms the water before it makes it back to the pool once again. In theory, enough loops through this cycle will warm up the water of the pool over time. The size of the array, the size of the pool, and the amount of sunlight all help determine how much the system can really warm the pool up, but it can help extend the swimming season noticeably. While the idea behind the system is relatively simple, installing the pool solar heater isn’t quite as straightforward. All the solar collectors have to be mounted up on a nearby rooftop. If there isn’t a rooftop close enough by, one must be built to hold the collectors, or they have to be ground mounted in a location free from many obstacles. With the collectors in place, it’s time to set up all the plumbing to make this system work. Pipes must T off from the existing loop to send water through the heater, but the builders have to create the system with valves so you can control the water flow. There will be times when you don’t want the water heated, as well as times when you want access to the collectors without excessive water coming through. Bypasses are set up and a series of valves giving you full control over where the water runs after the filter. A vent is also installed up at the peak of the collector array to help keep water out of the collectors when the pump isn’t running. Overall, the installation is simple enough for an experienced professional, but not something most DIYers would be comfortable tackling. Although people use heaters to warm the water temperature for both in-ground and above-ground pools, it’s much more common to heat an in-ground pool. The major difference between heating different pool types is in the size of the heater that’s needed. Above-ground pools lose heat much faster than in-ground pools, so they require a more powerful heater to warm them effectively over time. This must be accounted for when constructing the heater setup, or the system won’t perform as expected. The collectors of the system are the driving force behind all the heating power. Without the collectors, there’s no heat, and therefore no increase in water temperature. There are three major types of collectors used in pool heating to know about: flat-plate, bulk, and evacuated tube. Many people choose flat plate collectors because they are thin and therefore aesthetically pleasing, design wise. They’re also relatively simple to install and can be attached directly to your swimming pool line without worrying about heat exchangers. They provide plenty of heating power as long as there is direct sunlight, which is, of course, common throughout the normal swimming season. A bulk collector holds a large amount of water at one time to be heated by the sun. Because of the way bulk collectors work, they typically require a heat exchanger and a separate loop when heating pool water, but some people choose to tie them right into an existing pool line. The real benefit of a bulk collector is its simplicity and the fact that water can heat even when the pump isn’t cycling, but these collectors are the least efficient heating method. Evacuated tube collectors rely on vacuum tubes to generate and store heat, and they are the most efficient option available. They are also the most expensive, and many people don’t want to make such a big investment simply to heat their swimming pool. However, these collectors are the best option for those trying to heat water on cloudy days, and they stand up to wind the best as well, too. 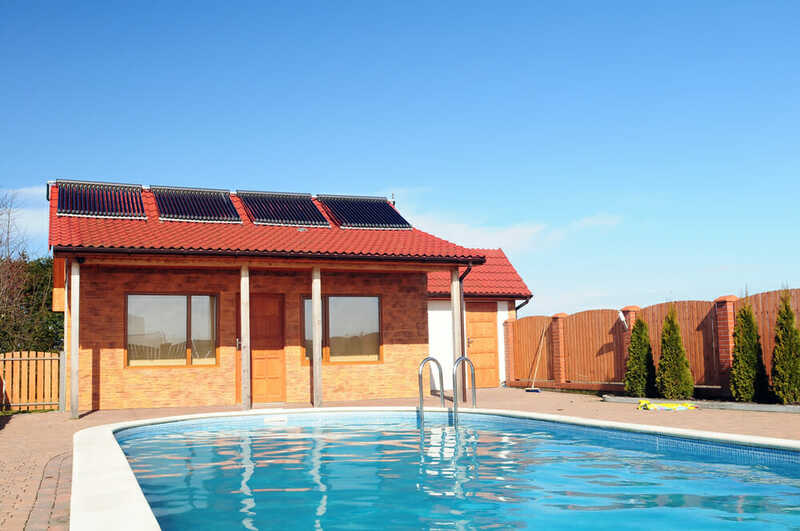 No matter which type of solar collector you choose for your pool heater, it’s important that the array is sized appropriately to offer enough heat to make a difference. That’s why everyone should work with a heating specialist to help them determine what size system to use. It’s advisable to have a professional install the system as well, but choosing the system is the most important job and should always be completed by an expert, even if you’re dead-set on doing the installation yourself.